Gran Canaria is an island with countless facets, breathtaking nature and sheer endless possibilities to create a holiday of unforgettable highlights. Quad biking is definitely one of the things that should not be missing on any Gran Canaria to-do list. It is not just about the thrill, which definitely isn’t missing on a Quad Tour. It is more about an extraordinary way to get to know the island from its rough but still beautiful side. 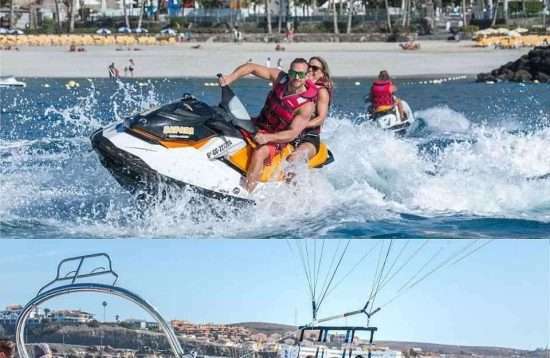 Most quad biking tours on Gran Canaria do not only lead along the exciting curvy asphalt roads winding through the valleys and mountains. And while you are covered in dust from top to bottom from your off-road experience and thankful to wear dust-proof goggles, you will be absolutely euphoric. There is just one focus: fun and action. The rear wheels are powered by a 22 hp engine and accelerate your ATV and blood pressure at the same time. 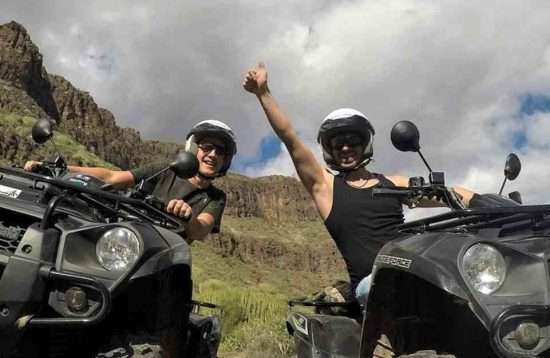 At the end of the tour, you will get off your evil vehicle completely dirty and only think: Quad driving on Gran Canaria, this is the ultimate adventure. Let’s do it again! Canyons, valleys and mountains are available from Puerto Rico to Las Palmas in uncountable quantity in Gran Canaria. You start your Quad Tour in Maspalomas and leave the tourist areas behind quickly. The roads are superbly developed, with plenty of bends and it is fun to drive your quad through them. You certainly remain careful and do not exaggerate, because at your left there is a 300 meters steep downhill into a ravine just behind the guardrail and the high rock walls on your right remind you, to keep focused. In addition, you are circulating on public roads and must pay attention to oncoming vehicles. 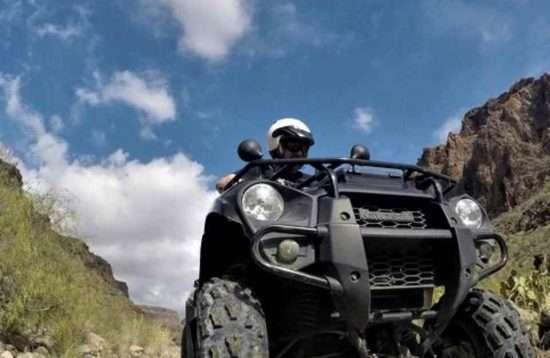 However, you will be pleased to know that large part of your Gran Canaria Quad Tour is driven off-road on unpaved roads where you do not have to worry about the oncoming traffic. On this track your wheels may spin from time to time and push your pulse. The off-road slopes mostly lead through secluded ravines and are lined with rocks, cacti and even palm trees. You will quickly feel like in a land of Thousand and One Nights. Hard to believe you are just a few miles away from Play del Ingles. While you get a lot of dust from your front man, now focus on the unconditional fun. Far away from the hotel facilities, the pools and the Shopping Moles you feel totally carefree. 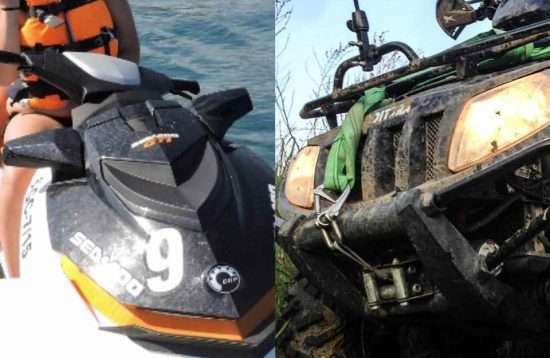 What is a Quad and What is the Difference to an ATV? A Quad can be classified carefully as a motorcycle on four wheels. This applies especially to its look. There are naked quads without fairing and some with fairing. The engine is also located in the middle below the tank and the seat. The handling of the quad, however, differs significantly from that of a motorcycle. Quads are classified as sport and leisure vehicles, which are mainly used on asphalt roads. Whereas ATV (All Terrain Vehicle) are the quads, that can be used off-road on fields in addition to paved roads. Our operator uses quads from Kawasaki. The Kawasaki Brute Force 300 is an absolute fun mobile. It is powered by a 22 hp single-cylinder four-stroke engine. 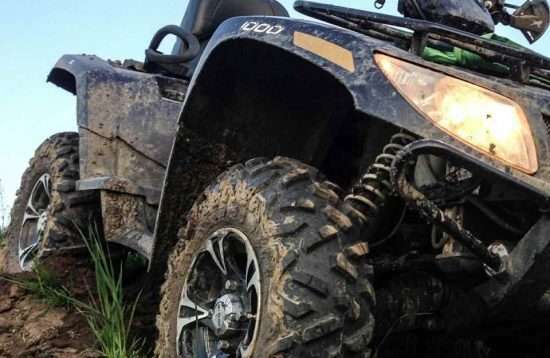 The rear-wheel drive gives this ATV an unruly ride and with the automatic gear you can focus on having fun. This pays off especially on open ground. You should not make the mistake of thinking that a quad rides like a motorcycle. That can be a dangerous mistake. A quad is a different type of vehicle and does not behave like a car or like a motorcycle. To gain some security, you need to do a couple of practice rounds before the tour on the grounds of the operator. 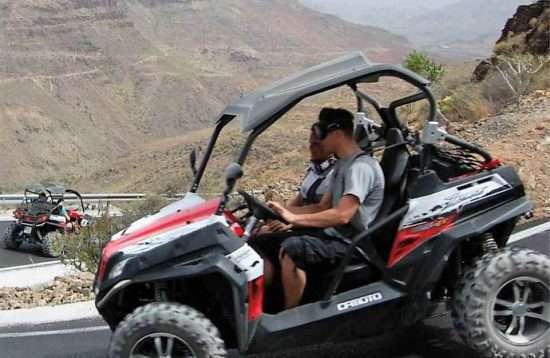 If you already are an experienced quad driver, you will not have any problems in Gran Canaria. Otherwise, keep in mind that the center of gravity of the quad is very high and you have to shift this center of gravity with your body when driving a bend to avoid that the quad tips over. In plain language that means, if you turn left into the curve, you also have to shift your upper body to the left and if it goes around to the right, you also tilt your upper body to the right. You just have to remember this formula: Left Turn = Body Weight Shift To Left & Right Turn = Body Weight Shift To Right. Somewhat tricky to get used to is the acceleration, which does not work as with a motorcycle on a turning handle on the right side of the handlebar, but via a throttle, which you must operate with the thumb of your right hand. You do not have to switch gear on the quad tours in Gran Canaria, because the operator only uses quads with automatic transmission. This means accelerating, steering, enjoying and braking. 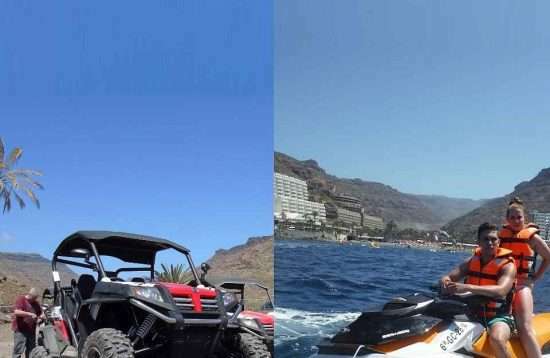 Who is Allowed to Drive or Hire a Quad Bike in Gran Canaria? In Europe, it is sufficient to have a driver's license for cars. This means that you must be 18 years old and have a valid Class B driving license. 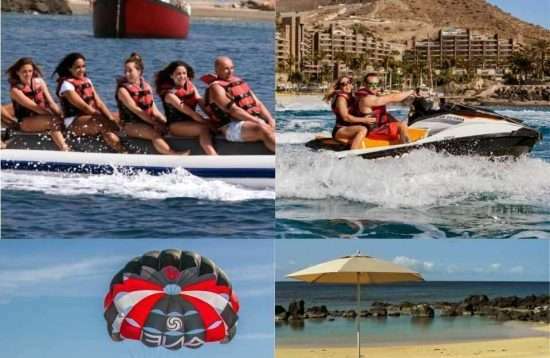 However, if you come to Gran Canaria and want to take a quad bike tour or rent a quad bike, you must be at least 24 years old and have a Class B driving license for minimum 2 years (for some operators / lessors even 3 years). This is done for security reasons by the operators and is ultimately prescribed by the insurance companies. It is a great advantage if you already have first experiences in quad biking or at least are regularly driving a car or motorcycle. There are no special requirements for passengers. However, they must constantly adjust their posture to the one of the driver. Especially when it comes to curves. This requires a certain basic fitness. Together, you should weigh less than 160 kilograms. Although a quad has four wheels, it does not have a closed cabin and you cannot fasten a seat belt. Consequently, there is a helmet duty for quads in Spain and Gran Canaria. The driver and passenger must wear a helmet as soon as they get on a quad and start driving.